The times we live in give rise to many problems that must be addressed in the Lord’s church. In every age the sins prevalent in the world affect the church to some degree and we must be on guard against these sins and warn others lest they be adversely affected by them. 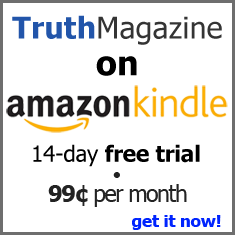 This special issue of Truth Magazine focuses on a number of these topics. This article will address the subject of the woman’s role in the church and the speaking of smooth things by some among us on this subject. As with most Bible subjects, the Bible’s teaching on the role of the woman in the church is misunderstood, perverted, or just plain ignored by the vast majority of religious denominations. Denominational churches have women serving in many leadership capacities. Women lead in prayers, lead singing, sing solos, and preach. They serve as priests, pastors, ministers, counselors, and various other offices within their denominational churches. This is partly due to the fact that denominations of men no longer respect the Word of God. A retired pastor for the Presbyterian church arguing for broader acceptance of homosexuality stated, “The Bible is not an infallible book, it is not error free” (Courier Journal, Louisville, Kentucky, March 8, 1998, A-1). With this kind of mentality it’s no wonder that women in denominational churches have taken leadership roles in direct rebellion to God’s word. Women are as active in making decisions for their particular denomination as any man. This has been a common practice for a number of years, but with the advent of the modern feminist movement it has become more pronounced. What has this to do with the Lord’s church? Exactly this: things that take place in denominational churches have a way of worming their way into the true church, creating division and apostasy. Instrumental music was borrowed from the denominations and this innovation caused division among God’s people. The social gospel was invented by the churches of men and eventually introduced into the Lord’s body, bringing more division. The sponsoring church embraced by liberal members of the church of Christ is a copy of the denominational concept of centralization and has caused much harm and schism within the body of Christ. So it is with the “women’s movement” within the churches of Christ. The more liberal, institutional churches have women serving the Lord’s supper, leading singing via “praise teams,” serving as deaconesses, teaching mixed classes of adults, leading in prayer, and occasion- ally preaching from the pulpit (for examples, see Peggy Sanford, “Cookies To Communion: The Changing Roles of Women in the Church of Christ,” Integrity, Issue 5, 1997, 82-87). The pressure of the feminist movement and the desire to be like the “nations” roundabout have aided in this perversion of the woman’s role in the church. What is the woman’s role in the church? What can she do? Can she serve in a leadership capacity over men? These questions must be answered in the light of God’s word and not with the prevailing attitudes of society, the practice of denominational churches, or the apostate churches of Christ. “To the law and to the testimony! If they do not speak according to this word, it is because there is no light in them” (Isa. 8:20). The speaking of smooth things to God’s children lulls them into complacency and opens the door to unscriptural innovations. It was so in Isaiah’s day and continues to be so some 2700 years later (Isa. 30:9-10). God is the One who dictates the role of women in his church and he specifically states, “Let a woman learn in silence with all submission. And I do not permit a woman to teach or to have authority over a man, but to be in silence ” (1 Tim. 2:11-12). This command prohibits a woman from leading in the assembly over men. Man is not at liberty to void this command. Also, man should not place the woman in a position that would tempt her to violate this command or allow a woman to take a leading position herself. One argument for allowing a woman to lead the assembly is that if a man asks a woman to address the assembly, then she is acting under the authority of the man who called upon her. However, he has asked her to do something that violates God’s will and no man has the authority to do such (1 Tim. 2:11-12; Col. 3:17). Another argument is that some women are more capable of leading than some men. Who leads in the assembly is not a matter of ability, but one of authority. Women have no authority from God to lead the assembly. God does not permit it (1 Tim. 2:11-12)! The fact that some women are more articulate or better singers than some men does not change God’s word on the matter. Men are charged with leading in the assemblies of the saints and women are commanded to submit quietly to their leadership. The argument could be made that a particular woman has more knowledge of a given situation than any of the men, so it is easier or better for her to make some announcement than the less knowledgeable men. Why are the elders or men less knowledgeable? Can the men not acquire the knowledge they need and then pass it on to the congregation? The presence of ignorant men still does not give the woman the authority to address the assembly in a leadership capacity (1 Tim. 2:11-12). Only unlearned or weak men would allow such to take place. The presence of women in business meetings is becoming more prevalent. This has been likened to Bible classes where men lead and women participate. Actually, the business meeting by its very nature is a decision-making process, an exercise of leadership, and God has excluded women from such leadership roles. While some advocate women’s active participation, others claim the women are to sit silently while the men transact the necessary business. However, are we not placing women in a position where they will be tempted to break their silence and speak up when they believe the men are making a mistake? Why introduce a practice for which we can give no affirmative authority from Scripture? Godly men can consider the needs of women without involving them in leadership roles. The men have a responsibility to lead in such a way as not to lord it over the congregation (1 Pet. 5:1-3). Elders or men are not to be tyrants, ruling with no concern for those they are leading. The fact that some men have lorded it over the congregation and abused their position of leadership does not give the woman the right to rule (1 Tim. 2:11-12). Two wrongs do not make a right. Women leading prayer in prayer groups with men present, women attending business meetings, women waiting on the Lord’s table, and women making announcements to the assembly are some examples of women easing into leadership roles in the church. These practices are not authorized by God and churches which allow any or all of these practices are paving the way for further departures from God’s word on the role of women. Places where one or more of these errors are practiced are conditioning the congregation to accept women in leadership roles. The place to stop it is at the beginning. Do not let the sinful practices get a foothold. Women exerting pressure to take a leading part in the assembly, or men who encourage women to take such a part, are sinning and need to repent. Our liberal society does not want to hear sin condemned and sinners called to repentance, but we must obey God and do those things which he has commanded in the way he has commanded. “Hold fast the pattern of sound words which you have heard from me, in faith and love which are in Christ Jesus” (2 Tim. 1:13).